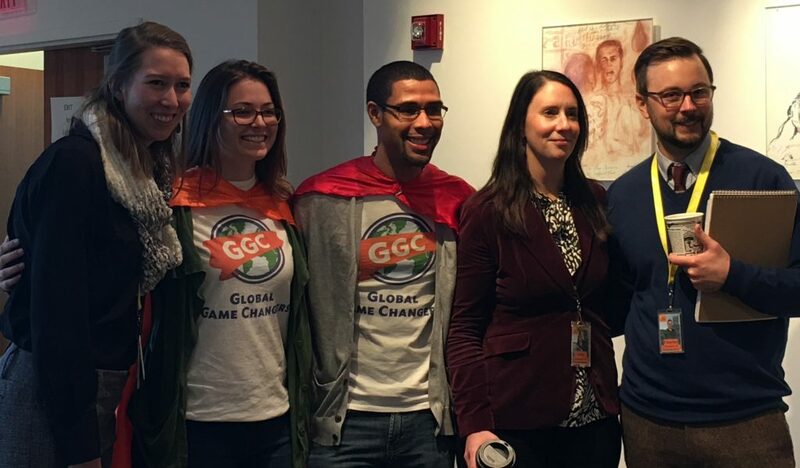 On Monday, January 11, 2016, 50 students from Louisville’s West End came into the Ali Center as part of the Global Game Changers In-Residence Discover Your Superpower Program. This program brings these students from Young Elementary into the museum every day after school for 16 weeks, where they learn the Global Game Changers curriculum, discover their unique superpowers, and ultimately complete individual service projects. To learn more, visit here. On Wednesday, we introduced the program to the Louisville community. 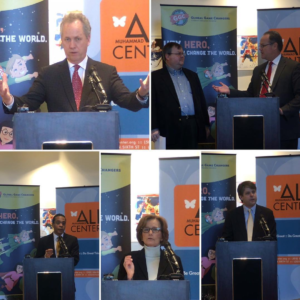 At a press conference held at the Ali Center, speakers included Mayor Greg Fischer, Superintendent of JCPS Donna Hargens, Ali Center President & CEO Donald Lassere, and our own Executive Director, Justin Walker. The press conference also included the presentation of Compassion Benches by Tom Williams, co-host of Compassionate Louisville, and Peter Hayes, Director of Service for Peace. The benches will sit at the Ali Center and Young Elementary, respectively, as symbols of this new partnership. They were paid for through a generous Service for Peace’s mini-grant program for Martin Luther King, Jr. Day of Service, part of a larger grant received from the Corporation for National and Community Service (CNCS). Finally, Donald Lassere announced that, inspired by this project, the Ali Center will offer free family memberships to families receiving K-TAP, an assistance program that provides financial support for families with dependent children. Families should come to the Center and present documentation of their enrollment to receive the memberships. Overall, it was a wonderful day filled with inspiring announcements regarding the compassion, innovation, and collaboration that define our community.